This is surely a sensible way to switch the farming industry from poppy crop to healthy crops by using tribal leaders, rather than burning the fields and leaving the local farmers with nothing! 1. Maintain public order and prevent social turbulence from escalating into protractred deadly conflict. 2. Polarizing political rhetoric and tactics must be forgone, however, tempting their short-term benefits may seem. 3. Meeting the needs and aspirations of fighting-age young men should be the first priority of national development policies and of programs funded by international donors. 4. Developing countries should have internal security forces (police and paramilitary) that are generously funded, professional, apolitical, and trained to meet the complex challenges of maintaining public order in a changing society. 5. Development policies that meet human being’s common aspirations–to feel good about their lives, the circumstances in which they live, and future prospects for themselves and their children– will contribute most effectively to keeping violent conflict and terrorism within acceptable bounds. 7. Good governance and democratization must be part of the “successful development” mix. Most important are governance institutions that are open to “bad news” and are self-correcting. 8. Multinational corporations, business, and associations should play a more active role in supporting successful development policies. 9. Successful development requires a long-term view. Giving sufficient weight to the long term requires institutional mechanisms and discourses that extend beyind the next election and term in office of political leaders currently in power. 10. There must be a realistic, rigorous, opportunity costs analysis of military options and U.S. equivalent expenditures for nonmilitary options before proceeding down the slippery slope of military solutions to complex development problems. “War and Peace in the 21st Century.” The Future. Nov-Dec 2006. Imperative 6, I think is completely unproductive. Author tried to have a middle ground between Capitalism, Socialism and darwinism! I think for Imperative 6, Government need to regulate the policies they want to adopt. There should be a balance between free market and government regulation with key areas under government authority, like Oil etc. 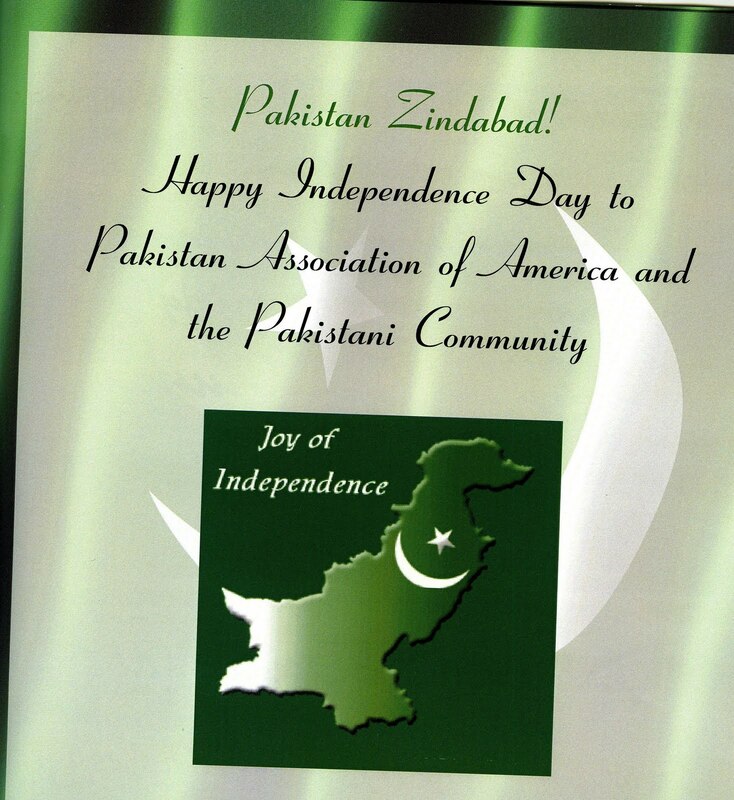 To: Pakistan Association of America-MI Board of Directors and the Executive Board. 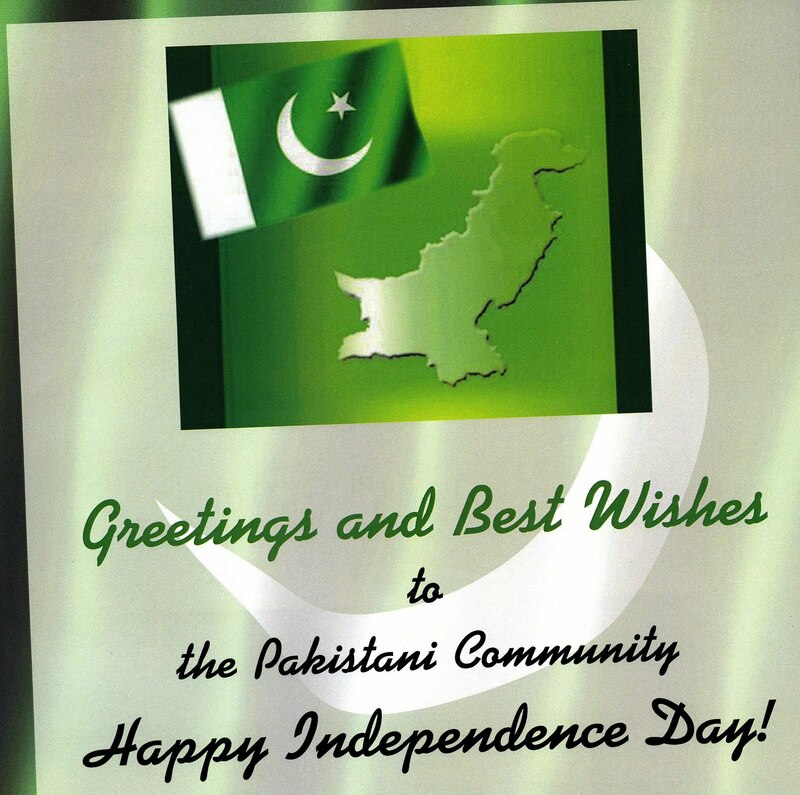 In this last month of August and at the height of the Pakistan’s 62nd Independence Day, I came across PAA-MI official booklet of congratulations to the Pakistani Community. That experience was of joy at first glance and the feeling of betrayal at another. I am here writing this to you all with deep sincerity, anger, and sadness. Pakistan came into being after many sacrifices and hardships that no one can deny and the mass migration of the Muslims from Hindustan to Pakistan was unprecedented at least in the history of Muslims and of South Asia. Many of those who witnessed that fateful day, the creation of an independent state for the Muslims for freedom to practice their religion, are still alive. In the wake of the happiness of the Independence Day, we Pakistanis should not loose all our intellectual sense and completely disregard the history of Pakistan. 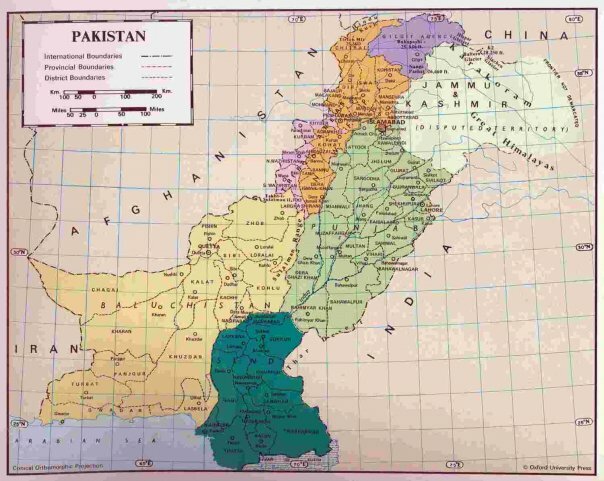 Looking at the pictures of Pakistan in the official booklet, I saw two outlined maps of Pakistan that were missing the Jugular Vein of Pakistan. So for a reminder to the Executive Board and the Board of Directors about our Jugular Vein, I would like to quote our Quaid-e-Azam (Great Leader) Muhammad Ali Jinnah. “The derivation of the word Pakistan – P for Punjab; A for Afghan (i.e. Pathans NWFP); K for Kashmir; I for nothing because that letter was not in the word in Urdu; S for Sindh and Tan for the last syllable for Baluchistan“. 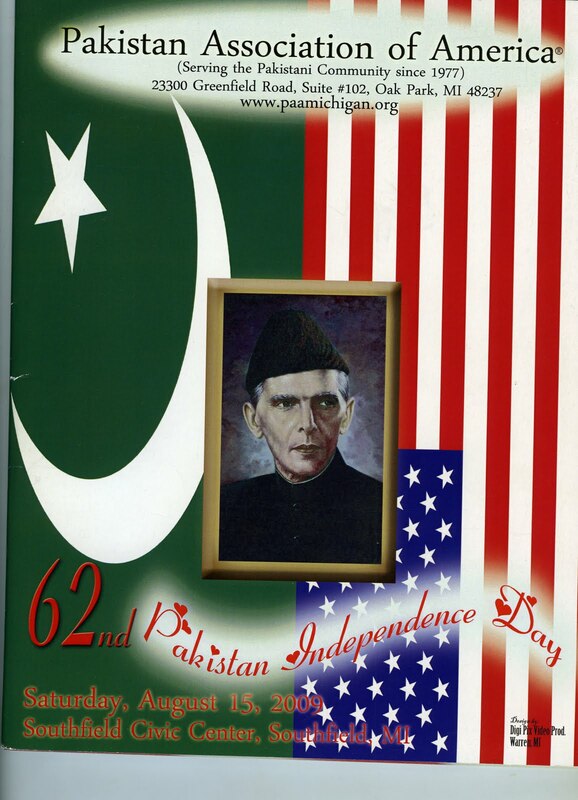 Sir/Madam this is carelessness on the part of your organization, that is suppose to represent Pakistan and the American Pakistani community, your organization approved the official booklet with an incomplete Pakistan. 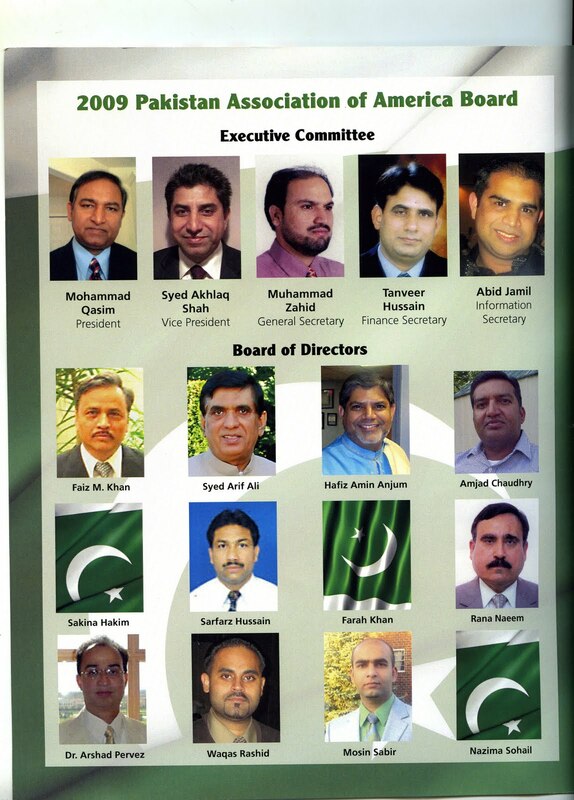 Sir/Madam Pakistan Association of America- Michigan is the only Pakistani American Association that enagages the American diplomats and Pakistani embassies for Pakistani American community in Michigan. This act represents unprofessionalism, and is an event of great grief. 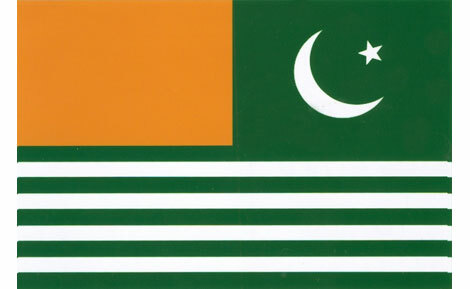 Kashmir has been and will be the Jugular Vein of Pakistan. 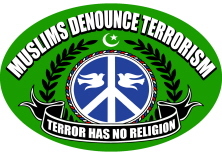 If we (the Pakistanis) are not going to make stand for the Muslims and Sikhs oppressed in the Indian held state of Jammu and Kashmir, who will? Looking back at the history and present, we see the world recognizes Palestine and Israel as a conflict zone and Jerusalem as a disputed territory. International Media pays attention to that conflict and it is on the headlines not only in US but also through out the Muslim World. Why this is not the case with Kashmir, we must wonder? Kashmir issue started in 1947, right after the creation of Pakistan and the independence of Hindustan (into India) from British Raj, while Israel was created in 1948. We had the opportunity of almost a year to address our stand point to the world. The official standpoint of Islamic Republic of Pakistan, as you must know is that the Kashmir issue should be resolved by UN Resolution, which calls for impartial elections for annexation. Then why must we be ashamed of our lost territory to India when we stand by the UN Resolution, while India trash the resolution completely, and moreover, declares Kashmir as her “Atoot Ang” when in reality it is not. You must also know that few months back, Indian held Kashmir was facing curfew for weeks and during this time, Indian security forces opened fire at unarmed protest of Kashmiris. Sir/ Madam I request you all, who have the supposedly authority of representation of Pakistani Americans, that if you cannot educate the Americans about the issue of Kashmir, please do not show a divided Pakistan in your official publications. I am posting an Official Pakistani Map from the Ministry of Foriegn Affairs. Please refer to more Pakistani maps at Hamara Pakistan Fan Page. In conclusion, make sure this carelessness doesn’t happen in any of other official publishings. Pakistan was created based on the ideals and thought of Allama Iqbal and Quaid-e-Azam Muhammad Ali Jinnah. It is upon the present and future generation of Pakistanis around the world to reflect those good ideals, which we so often chose to ignore. PAA-MI can do its part as an organization. Umer Sultan can be contacted thekeytopower@gmail.com. Note: Readers are free to post at their blog as long as they post the entire Open Letter. Also please post/ e-mail the link of this Open Letter to the Pakistan Association of America-MI to show your solidarity of a Complete Pakistan at Their Website and e-mail them at paamichigan@gmail.com and Please post at their Facebook Fan Page. More Maps can be found at Hamara Pakistan Facbook Fan Page linked in the Open Letter above.